The Federal Government on Monday commissioned 6 fast patrol crafts at the Naval dockyard in Lagos to tackle maritime crimes on the national waterways. Speaking at the vessels' commissioning, the Honourable Minister of Defence, Masur Mohammed Dan-Ali stated that the commissioning of the 6 Fast patrol crafts and 10 Rigid Hull Inflatable Boats (RHIBS), which are about to be inducted into the Nigerian Navy fleet, will go a long way in combating piracy and other maritime vices that pose as challenges for the nation. According to the Honourable Minister of Defence who was the Special Guest at the occasion, “The reality of today expose our dear nation to be challenged by multi-faceted threats from both continental and maritime fronts, with attendant grave manifestations and Increasing threats to maritime security. “This poses a huge challenge that negates the vast potentials of the nation’s maritime domain and the Gulf of Guinea region in supporting the prosperity and well-being of states and their people. The peaceful use and maintenance of rule of law and order in this expanse have been afflicted by cross-border threats which constrain investment and economic development. “Criminalities like piracy, sea robbery and attack on strategic oil installations have complicated the nation’s maritime security environment and threaten with dire consequences, the overall wellbeing of the nation. For a littoral state with the huge dependence on her offshore resources, maritime security is vital to the nation’s well-being. Against this background of threats, the entire nation would invariably be at the risky situation if we do not insist on a motivated and virile navy like ours. “I must at this point pay great tribute to the leadership of our leader President Muhammadu Buhari, officers and men of the Nigerian Armed Forces for their heroic response to the scourge of insecurity in the nation and in particular our maritime domain. I also acknowledge your tremendous efforts in prosecuting oil theft, piracy and other economic and environmental crimes that have seen to their substantial reduction and the strengthening of the stakeholders’ confidence on freedom of navigation in our waters. In this regard, I note with satisfaction that, in synergy with the other Armed Forces, the Navy has continued to maintain effective deterrence and appropriate operational posture. “The induction of the platforms today is in line with the current administration’s promise to keep our nation safe. This commissioning ceremony is yet another demonstration of this administration resolve of protecting the nation’s maritime domain through the provision of appropriate military platforms and operating equipment also to the credit of His Excellency President Muhammadu Buhari’s administration. 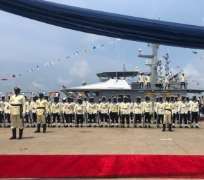 It is my sincere hope that these new additions to the fleet will boost the operational capability of the Nigerian Navy, especially in the effort to stamp out the various threats prevalent in our maritime environment. “Additionally, it is crucial that we make progress in the provision of peace and order in our maritime domain. The dependence of the nation’s economy on offshore resources as well as the enormous potentials of the maritime sector to contribute to national food security and employment generation makes this highly imperative. Thus the centrality of maritime security for national development commends the maintenance of a virile Navy notwithstanding the tremendous cost implied. Quite happily, this ceremony exemplarily falls in tune with this expectation. “Accordingly, I am also obliged to commend the administration of His Excellency President Muhammadu Buhari GCFR for staying true to its policy of providing an enabling maritime environment for improved commerce and shipping in the ongoing efforts to diversify the economy. The procurement of these vessels by the Ministry of Defence again demonstrates this administration’s unwavering commitment and willingness towards strengthening the Navy through the provision of modern operating equipment and infrastructure.